Last night I was super keen about warping my rigid heddle loom with my knitter friend Jenn to get a weaving project underway for a charity sale that I’m selling my craft items in. I had most of the warp yarns picked out and the weft yarn as well. Jenn was wanting to learn how to warp a loom, and learning on a rigid heddle loom is a good place to start as its fairly simple. So away we went with loading the warp onto the loom using the finest reed I have (12.5 dpi) and everything was going smoothly as we wound the yarn onto the back beam of the loom. That is, until I cut the warp loop in preparation for threading, and the inertia from the wound warp uncoiled on the back beam. Which is akin to a roll-blind boing-ing back up onto itself (I searched for an appropriate youtube video, but none to be found). The warp could not be salvaged. 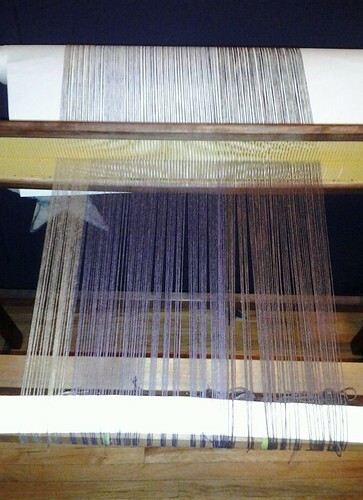 I was crestfallen as we had spent over an hour just putting the warp on the loom. Its a good thing I was in a good mood & drinking wine, otherwise I may have burst into tears. At 9:17pm, I asked Jenn if we should start again. She said yes, and so away we went. We motored away and managed to warp & thread my loom by 10:40pm. 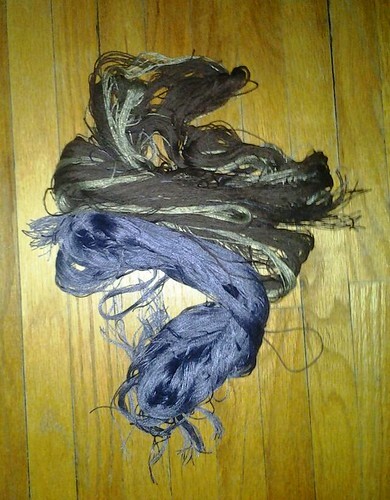 Here’s the proof that we actually managed to warp, thread, and tie on the warp yarn. Its Jojoland Harmony in HC06 colourway – variegated yumminess . Wish me luck on the rest of this weaving expedition! You are currently reading When warping goes awry at When Gaia Smiles.